Tonight I was honored to join the masses who arrived at Topher and Lisa's doorstep with dinner. We had been praying for Margo's safe return from the RSV-recovery wing of the hospital having gunk removed from her lungs. But there she was this evening, home, cuddled in her grandmother's arms, looking pink and perfect. Her dark hair swirled over the top of her sleeping blanky. Brother Miles was adoring her comical drowsiness. Her other siblings were dancing around with light sticks left-over from the Fourth of July. When a sibling has a baby (this was the thirty-third time for me) it is always a happy time. In my younger years I was often called to take over the household as the couple heaved to the hospital. These days I offer my baked mac-and-cheese. But this time was really unique in that my new little niece needed our prayers too. And though I feel a sense of satisfaction when I've been able to bring a meal, seeing Margo looking so healthy tonight made me appreciate the service of praying for someone you love and having that prayer answered. 1. Do you prefer to offer babysitting or bringing in a meal to a family in need? 2. If you do bring a meal what is usually in your dinner basket? 1.) Heat oven to 375. Spray baking dish with cooking spray. Cook pasta and drain. 2.) In a saucepan over medium heat, melt butter (leaving out the two Tbsp.) wisk in flour, mustard and salt. Gradually wisk in milk. Cook and stir until mixture thickens and bubbles. Remove from heat. Stir in cheese until melted. 3.) 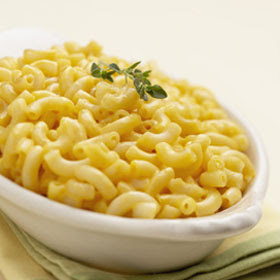 In dish, combine sauce with macaroni. In a small bowl, melt 2 Tbsp. of butter. Combine with bread crumbs and Parmesan cheese. Sprinkle over top of macaroni. 4.) Bake for 17-20 minutes or until top crust is golden. Let stand 20 minutes before serving.